Today, in one of the many announcements that kicked off EMC World, EMC announced the new version of their ScaleIO product. If you’re not familiar with ScaleIO, EMC defines it as a “software-only server-based SAN that converges storage and compute resources to form a single-layer, enterprise-grade storage product. You can also think of it as similar to VMware VSAN, but usable for things other than VMware. Essentially, ScaleIO is software that runs on servers. It combines the servers into a pool and aggregates their direct-attached storage (DAS) into a single storage resource pool that can be shared by all the servers as if it were an actual physical SAN array. This is a great way to follow the “bring the storage close to the compute resources” model. Since a ScaleIO cluster can start with only a few servers and scale up to thousands, it allows for the creation and handling of massively-parallel compute processing workflows. ScaleIO can take advantage of any and all disks installed in the servers: HDDs, SSDs, and PCIe Flash cards. Previously, servers in the same ScaleIO clusters needed to be more or less the same. EMC has added support of mixed physical and virtual servers, and supports asymmetric hardware configurations. 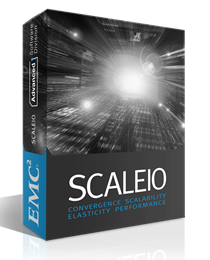 Version 1.30 makes ScaleIO more elastic. It’s now possible to dynamically add or remove resources from a ScaleIO cluster. This version also adds data protection in the form of a two-copy mirror. This allows for support of both forward and backward rebuilds. Lastly, ScaleIO 1.30 is supported by the ViPR Controller (more about that shortly). ScaleIO 1.30 will be GA before the end of Q2. This entry was posted in ScaleIO, Software-Defined and tagged Announcement, EMC, ScaleIO, SDS, Software-Defined, Storage, Virtualization. Bookmark the permalink. Hi, want to let you know that I am a ScaleIO employee and the reporting in this article is not very accurate. ScaleIO has always supported dissimilar configurations, it’s one of our key differentiators from other solutions out there.backward and forward rebuilds have been part of the solution for quite some time as well! Removing and adding resources… Same story! So want to know what is new? How about fault sets, this feature protects against entire rack or powergrid failure. Improved management integration for VMware, ScaleIO management from vcenter. Improved caching functionality using server based DRAM or flash resources. Support for recoverpoint to allow CDP between sites, recoverpoint will be updated Q3-4 time frame for this. So I advise anyone interested to contact a local EMC resource to get the downlow! Both the briefing and previous versions of the compatibility guides were explicit about minimal support for dissimilar configurations. I explicitly mentioned the dynamic addition and removal of resources you mention. 1. This was an article about ScaleIO, not RecoverPoint. 2. RecoverPoint support for ScaleIO wasn’t available at the time of the announcement, and, as you metion, still isn’t available yet. If there are any actual inaccuracie in the article, I’ll be happy to make corrections.